Presenting a sleek façade to its neighbours. The finely detailed screens of No. 19 Jln Angin Laut conceal a house nestled gently into a garden. Its entrance elevated above the ground, one has to ascend a glass staircase to enter the house. Opening the solid timber front door, one is greeted with a swimming pool and patio surrounded by lush greenery, amply shaded overhead but admitting light and air from the sides, this space is a paradigm of living comfortably in the tropics. 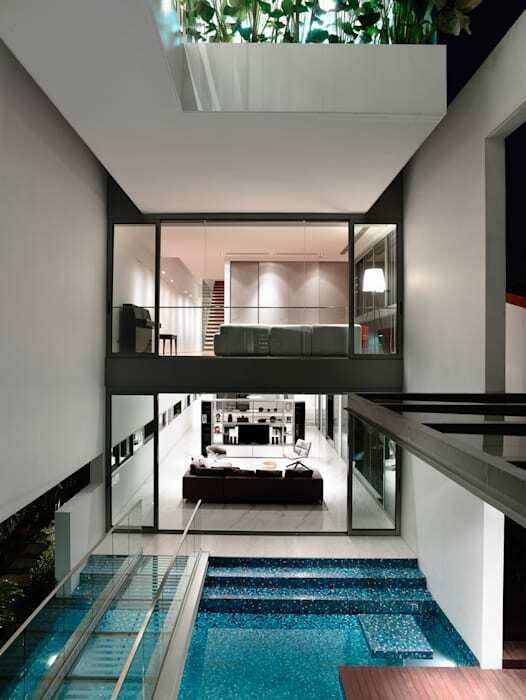 A glass bridge spanning lightly across the pool leads into the living room. This bridge extends the threshold of the house, prolonging the act of entering and highlighting the importance of this space to the overall design of the house. The rest of the house takes its cues from this scene, the main living spaces being punctuated with light, greenery and timber accents. Together with the skillful manipulation of solids and voids, the overall effect achieved is that the architecture seems integrated harmoniously with nature.